The Queen is set to have an official presence on Facebook when a British Monarchy page launches on the internet-based social networking site. Buckingham Palace says it is not a personal profile page, but users can "like" the service and receive updates on their news feed. The Facebook page is due to go live from Monday morning. The page will also feature the Court Circular, recording the previous day's official engagements. Also featured will be information about royal events and ceremonies, searchable on a UK map. Its creation is a collaboration between Buckingham Palace, Clarence House and the Royal Collection. Although users of the social networking site will be unable to add The Queen as a "friend" or attempt to virtually "poke" her as they would with anyone with a personal profile, they will be able to find out what royal events are happening nearby. 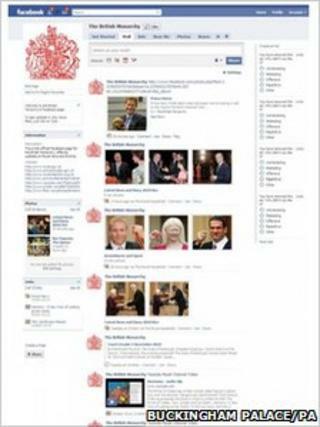 The launch of the Facebook page follows the introduction of the Monarchy's Flickr account earlier this year. It also joined Twitter in 2009 and established a Royal Channel on YouTube in 2007. Prince William has already been officially featured on social networking sites, with updates about his tour of New Zealand in January posted on to Facebook and Bebo by the New Zealand government. Facebook has become a global internet phenomenon since it was started by Harvard undergraduate Mark Zuckerberg in 2004. He created it as a network for his fellow students but the site's appeal quickly spread to other universities and later world wide.